Here are some thoughts on cube action, taken from a recent five point match. I'm playing the Black checkers, trailing 5-away, 3-away. White is on roll and on the bar. Cube action? Well, in the match White confidently cubed and after a bit of thought, I took and not very happily either. Were we right? It's interesting to see what XG thought. At 4-ply it doubled confidently, at XG+ it revised its cube to marginal and a full rollout downgraded White's cube to a blunder! We can hardly criticise White for blundering when the world's most powerful bg program playing at 4-ply makes a mess of it. I nearly passed it too, but of course now that I know the answer I can see that it is a very easy take! Even though this position is horribly gammonish, White doesn't get full value for her gammons, as she can only use three of the four points and of course her backgammons are no better than a gammon. 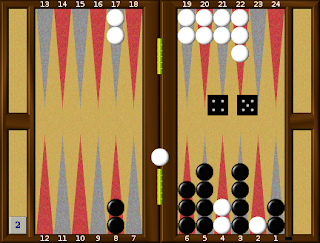 Moreover Black can recube and cancel out White's gammons entirely if he can get to around 40% in the game. *I could fill a book with all the different directions this game could go. What actually happened is that White hoovered up almost everything, but was unable to make her 4pt. Black anchored there and gradually entered all his blots and we came down to Last Chance Saloon. Some people cube this, reasoning that they are certain to lose a gammon if they miss. What this does is give up the equity that they would have if they hit and manage to save the gammon, but still lose the game. Black should hit and then see where he has got too.A redouble is only a very small mistake though, because if Black can hit, he will immediately jump to around 40% in the game! This is a very useful figure to remember and it is surprisingly high given that he has yet to make a point anywhere. Here's a typical position a couple of rolls down the line. Black is about 41% to win this game, so just in his window. He should double. I didn't. He should double this one as well, although rolling is only a minute mistake. I didn't cube, but I did find the right play for the 4-1. See if you can. The point of showing you these positions is to make the point that you mustn't wait until you have made several points. Get that cube across and double your opponent in. Waiting until you have a cash is criminal! *Some of you will, I hope, be asking, "How does he work out that Black needs a minimum of 40% to have a minimum recube?" It goes like this. In all these problems, you need to figure out what you risk and what you hope to gain. If you divide your risk by your risk plus the gain, you arrive at the figure that you need to make it worthwhile. Here, a redouble for Black risks the 16% Match Equity that he has at 5-away, Crawford in order to try and gain the difference between 3-away, 3-away (50%) and Crawford, 3-away (75%). He risks 16 to try and win 25 and the formula is Risk/Risk + Gain, 16/16+25 = 16/41 = 39%. Until the next time, enjoy the game! Many, perhaps most of us, view the game in fairly simplistic ways. We count the pips, we count the shots that we leave and take into account the strength of home boards, but some positional features are rarely taken into account. Stacks, the "silent killers" as Robertie christened them weaken a position tremendously and we need to work on developing them as a priority, even when we have other things to do. Here's a nice example. 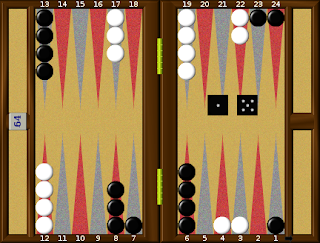 It's 0-0 in a 5 point match and Black has a 6-4 to play in this almost symmetrical position. He chose to run with 24/14, after which he will lead by nine pins, but it's a large error. The stacks are the clue. White's stacked 6pt means that it is very hard for her to build her position naturally and she faces some awkward rolls next turn, so there is no great pressure on Black to escape and in fact trying to do so eases the pressure on White a little. Black must develop his own stacks. He would have liked to hit of course, much the best way to get stacks moving, but he can't do that, so he should just make the 2pt. Then if he can hit somewhere next turn his board will at least have some teeth. Post a mental red flag on your stacks, a warning to get them into the game asap. In game two and trailing 0-1 to 5, Black again has a stacked 6pt. He has just cubed. Black has a big pip lead, 124-152 before this roll, so it seems reasonable to try and get into the race with 18/13, 18/15 and leave 13 shots. It's an error. Black's stack on the 6pt is even weaker than before, because he has already made the 4pt, one of the natural homes for those checkers. His best play is 8/3, 6/3, leaving 14 shots rather than 13, but strengthening his board and keeping his anchor, a good trade for one extra shot. Note too how leaving the anchor lifts the pressure on White's outfield and her blot on her 9pt. Like number 11 buses you wait for ever to see an unstack problem and then three come along at once! Now we are in game 4 and Black leads 4-1 crawford with a 4-2 to play. 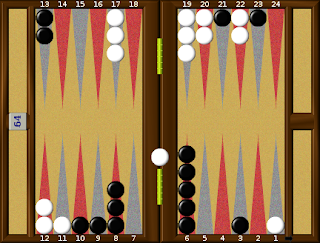 A funny old position and Black leads 118-145 before the roll. He looked at the two blots in White's home board and decided on 15/9 as his play, a blunder. Not only does this leave an unnecessary shot, but it does nothing about the stack on the 3pt. Those spares have to be put to work and 6/2, 3/1 is the play, strengthening the board and slotting the 2pt so that Black will have a good 1 to play. 15/11, 3/1 is a good alternate on the same theme. Of course there isn't much point in developing stacks just for the sake of neatness, but in this position it seems highly likely that there will be hitting down the line and a strong board is going to be very useful. Flag those stacks and get them moving. When your opponent has stacks, don't go near them, as she wants to hit with them if she can. Lastly, don't create stacks if you can possibly avoid it! Imagine you are trailing in a match. Of course you are aware (I hope!) that you want to try and give an aggressive and gammonish double. You can double a bit earlier than usual because your opponent can't use the cube with normal freedom and because gammons gain more equity for the trailer than they do for the leader. Gammonish doubles come in more flavours than Baskin-Robbins, but here's one you might try. Black trails 5-away, 4-away and has two men on the bar. Black trails in the race by 3 pips, has two checkers on the bar and is an underdog to hit, but this is a very strong double. Why is that? Counting hitting numbers and the race are very useful of course, but here there are two more factors that count for more. Firstly White has five (5!) 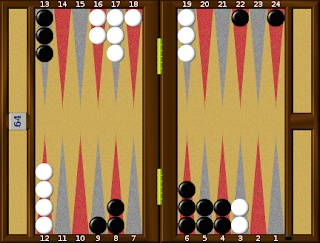 blots and secondly Black has the ideal 6-5-4 board with spares nicely poised for building a prime or blitzing. These things add up to volatility. Black may only have 14 hitting numbers but White will have nine dancing numbers after those hits (16 after 5-5) and two on the bar after 1-1. Black will win about 62% from here including 30 gammons that will take him to Crawford if he has doubled. What happens when Black misses? White will still be under a lot of pressure to tidy up those blots and run her last checker out, so Black still has a lot of life after a miss. In the match Black decided against cubing and rolled 3-1. White rolled an excellent 5-3 from the bar to produce this next position. One feature of the first position is that it isn't easy to see what comes next, because there are so many possibilities and there is a near-universal dislike of cubing when the board is a fog of confusion. Now the position has settled down nicely. 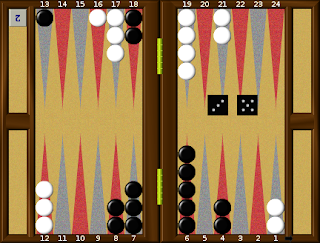 Black has entered both his checkers and White has miraculously got down to a single blot. Black leads by 17 pips and has 26 numbers to hit, both big improvements, but all the volatility has leaked away in one sequence. This position is relatively static and a lot less gammonish, so that although Black still wins about 62%, his gammons have dropped to 18. A cube now is a blunder. So, what do we need to lok out for? Any time that you have that 6-5-4 combo, stick a mental flag on it that says "Cube Hot". When that is coupled with a decent number of shots and blots, you can usually ship it in, even when as here Black has men two men on the roof. Don't wait for the position to settle down into something that you recognise. When trailing in a match, volatility is all! Who was that masked man playing the Black checkers? Don't ask Kimo-savvy, his identity must remain a mystery. Until the next time, enjoy the game. Regular readers (who deserve more regular posts, apologies) will know that I am a big fan of the early aggressive double. 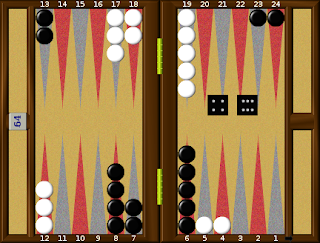 Although sometimes a mistake, it does open the possibility of a very wrong pass (particularly when it comes with a strong whiff of gammon), it does mean that you can't make another doubling mistake in that game and it does mean that your opponent can make a mistake when she redoubles, or more commonly misses a chance to do so. What should Black do here? It's 3-away, 3-away and White is a GBot on Fibs, Gnu 2-ply in other words. Black is on roll, White is on the bar. 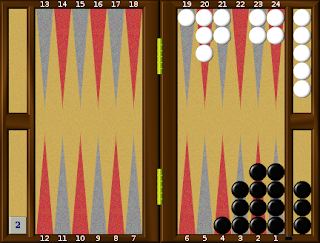 Black leads by 130 pips to 179, he has a much better board and White has to enter before she can do anything. Is this enough for a cube? The first thing to note is that there is no chance of a wrong pass, nor will White make a mistake with the redouble, because she is a gnu. However, Black will win about 57% of the games from here, of which 33 will be match winning gammons. Is that enough for a double? No, cubing now is a big mistake. With four men back, White anchored and some useful blocking points in White's outfield to negotiate, waiting is entirely correct and the cube is a blunder. The problem for Black is that he has very few market losing sequences, His best roll is probably 5-5 (23/8, 20/15) and if White dances after that he will actually be slightly too good to double! The rest of the time he will sometimes have a cube, sometimes not and will usually still get a take. The other downside to cubing for a human is that Black's play isn't always easy, in fact I managed a blunder after double/take when I rolled 6/5. I played 21/10, but the pipcount tells the story. Because I lead, I need to dismantle my back position and start the journey through White's outfield while she is still dancing. 21/15, 20/15 is easily best, establishing a useful outfield point to act as a safe house for stragglers passing through. This roll (and the correct play) is actually a market loser after a dance, but not by much. Hanging onto an anchor that has become irrelevant is a very common mistake, certainly one that I make a lot and I think it springs from a conception of the anchor as a safety net. Bg can't always be played like that and this position is one where Black needs to play boldly in order to reach a good doubling position, or if he has given the cube away, go for the win! So bold cubing good, bold cubing in a difficult position with few market losers against a brilliant opponent, bad. Discriminate! Confession is also good for your error rate. If you play carelessly and just say, "Oh well, nobody was watching" when XG pitilessly exposes your blunders, then there is a very good chance that you'll keep playing carelessly in the future. I can't stress enough how important to get into the habit of always trying to find the best play, even in matches against bots that mean nothing. All of us I think, make more blunders through carelessness than we do through misreading a position. So, for a while, I'm going to use this column to just show you some of the blunders that I make. This will do wonders for my own play and with any luck, the positions will throw up some ideas that will help everybody. 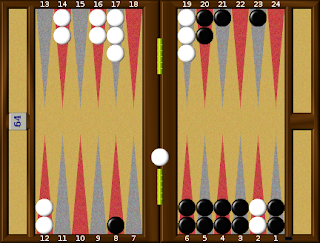 Here's the first of these, dorbel (Black) playing a Fibs GBot (White), both sides 5-away. I think everybody will make the bar here, so it's a choice of three fives. Actually here is the first hurdle to jump. Did you actively consider all the fives? Can't say that I did, but there's nothing intrinsically wrong with 13/7, just a bit stolid. What I actually did was to make the action play, 23/18, 8/7, but this is easily the worst five. It encourages White to attack while she has the stronger board and no other convincing game plan for the moment. Correct is 8/7, 6/1. Once you've been forced to hit loose on the ace point, it's almost always right to make it, converting a minor embarrassment into a small asset. It's right here, by a lot, as it almost always is in the opening stages of the game. I actually knew this, I just thought that this one might be an exception! It isn't. Later on I'm on the bar with a 2-1 to play. I made the 23pt. I can't really describe this as a thought process, but I think what happened was that my instinct was "Phew, I've entered and I can anchor, so that'll keep the gammons down." That's true as it happens, but of course I have to give up a lot of wins to save those gammons and bar/24, 6/4* is correct, trying to take away half (or all) of White's next roll and stop her adding another point to her prime. Instinct isn't a substitute for thought. Lastly, if you can stand one more from this terrible game, I hit a late shot and got round to this 5-5. I took two men off but stacking the ace point and keeping the closed board is right. This makes Black a small favourite, while two men off makes him a small underdog. Once again, thought is required. 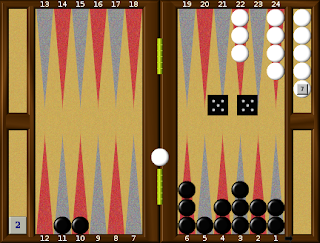 Taking two men off leaves Black in a seven roll position with a five point board. Playing 11/1, 10/5, 6/1 leaves him in an eight roll position, but White can't enter and from this the worst that can happen is that he will come down to the same thing next turn. If he can throw 3-2, 2-1 or 1-1 he can do better than that, taking off a checker or checkers and keeping the board for yet another roll. Learn anything? I did, so tomorrow (always a moveable feast on this blog) we'll have a look at some more dorbel blunders. Until then, enjoy the game! The 4 cube is the bg equivalent of the Mighty Hammer of Thor, deadly in the right hands. The player prepared to ship a 4 cube at the first opportunity will wreak havoc at all levels below World Class. The possesion of the cube can be worth a lot, but only if you are prepared to use it! In a recent match I had two opportunities to use it. Here's the first. You are Black, holding the 2 cube in the first game of a 9 point match. What's the correct cube action for both sides here? The first question to ask yourself, always, is "If I was White, am I 100% certain that this is a take? If not, it must be a double." This is known as Woolsey's Rule. Pretty clearly you can't be certain that this is a take, with two men on the roof against a four point board, so Black is good enough to redouble. Now move on to question two. "Am I 100% certain that this is too good to double? If yes, play on for the gammon for at least one roll, if no, turn the cube." This is known as dorbel's rule. Purists don't like this rule, but in practical terms it performs quite well. So, what's the answer? This is a correct redouble and a correct pass, even though Black's checkers are not well placed to close the board and he still has one checker behind a five prime. Failing to cube or taking the cube are both small blunders costing about 1/10th of a point. Dorbel's rule works quite well in situations where the decision to cube or play on isn't clear, because if you get a pass it puts two concrete points onto the scoresheet and when you get a take in this position , as you often will, you gain 2/10ths of a point in theoretical equity. Actually you often get takes in positions much stronger than this and passes in positions that are much weaker. The point of cubing, often missed, is that it allows your opponent the opportunity to make a mistake. The Mighty Hammer of Four is a terrifying weapon. The big temptation is to play on in the hope that if things go well you will win a gammon and if things deteriorate, you'll be able to cash later. That's often the case of course, but it's easy to see here that an "ordinary" number for Black, 5-3 say, followed by the same number for White will leave Black in a position where not only can't he cash, but he won't even have a redouble! I failed to redouble that one, forgetting my own rule! TIP:More mistakes are made by forgetting the things that you already know than are made from technical ignorance. Later on I led 4-2 to 9 and holding the cube, got down to this juicy position. Uneven distribution and different numbers of checkers, so we can't rely on formulae that only count the pips. Black will usually waste a lot of pips here, initially when he throws sixes or fives and later when he gets down to only checkers on the two and one points. White on the other hand will use all her numbers efficiently at first, as even a 3 will fill her gap nicely. She also has two extra checkers off and less wastage on the lowest points. Black though has two things going for him. He gets to roll first and all the lower doublets are much better for him than they are for White. He is a lock to be off in six rolls and to win without doublets White will need to get off in five rolls. She'll have to roll pretty well to do that, so this might be a redouble so I did a Thorp Count . This old fashioned formula is very easy to apply and if you make some little adjustments for gaps, can be very accurate. Actually here, Thorp rates this as an initial double but not a redouble and given that Black leads in the match he should be a little more conservative than usual in bringing a large cube into play. Nevertheless, making a small adjustment for White's gap makes a difference. Also, Black will get some incorrect passes here and with the end of the match so close, White's opportunities to redouble to 8 are going to be limited, so I finally turned it and White correctly took. Both actions are correct. Note that Woolsey's Rule still works here. I couldn't be certain that this is a take for White, fairly confident yes, 100% certain, no. If the cube dies with this turn, at 0-0 to 3 say, this position is a marginal take/pass, so a useful reference position. When you take a 2 cube, part of your equity lies in your willingness to use it if things go your way. Don't be afraid to use it! Swing that Mighty Hammer and reap the rewards. In the previous post, we saw how the bold play was correct, even though it enhanced the match leader's gammon risk. Winning the game is a very good way of not being gammoned! UK expert Rick Janowski points out that in fact in these situations the money play is usually correct and that it is a very common mistake to over-estimate gammon danger for the leader. Today it was my turn in the spotlight, playing for UK against Moldova in the Inter-Nation Cup on GridGammon. I led throughout the match, so played a number of games where I was keen to keep the opponent's gammon chances down. This one came when I led 8-5 to 11. I rejected 6/1, 5/1 and I hope that you would too. Burning two spares and leaving the problem of how to clear the 8pt is not the way to go. Black has to make a bold play while White is on the bar. I went for 8/3, 5/1 leaving five fly shots for White, but this is still not bold enough! The money play, 8/3, 6/2* is best, essential to stop White from making the 23pt anchor next roll. It's so easy when the winning post is in sight to try and avoid the last minute turnaround, particularly when White has such a good board, but it's right to leave eleven shots here and the match play is a smallish error. Allowing for gammon losses is much more important when the cube comes across. Here's a good example that came when I led 8-2 to 11. White doubles, is this a take? For money this isn't too hard. 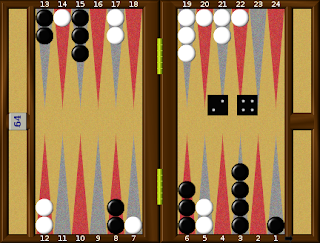 Black will at worst have an ace point game to fall back on. This isn't enough for a take on its own of course, but added to his other chances it makes for a pretty easy take. Here though, the cube is worth somewhere between next-to-nothing and not-a-lot and a gammon loss is very serious. XG++ will pass it, as did I , but a rollout indicates that it might be an ultra close take! Good reference position if you save them. 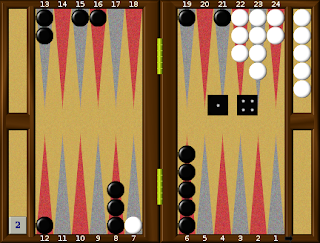 Take or pass, this one loses Black one point, always after a pass, on average after a take. If you feel that the position is a marginal take/pass like this, which side should you plump for? Conventional wisdom suggests take, so that your opponent has to play for his point, rather than being handed it on a plate. If you think that you are clearly the better player this makes a lot of sense, as White in this position may well make some mistakes on the way home that will boost your equity a bit. If on the other hand you are the weaker player, it might make sense to bin this one and wait for a better opportunity later. You want to escalate the cube in a relatively skill free environment. Until it's your turn in the spotlight, enjoy the game! Paul Money, 64, married. Bg player since 1989. Over 300 published articles in print and on the Internet. Private Lessons available, cheap to poor people, expensive to rich people.